Stephen Longstreet has been charged with a task: find out who’s been borrowing his Uncle Anthony’s greatest invention, a time machine, without permission. He never expects the miscreant to be a lovely, red-haired woman, or that in apprehending her one dark night he’ll fall into the contraption and travel through time with her. But once he’s met Bridgetta Maguire and discovered her powerful mission, his heart refuses to let him turn away. Bridgetta isn’t sure how or why the time machine she stumbled upon in a yard in Warsaw, Poland works. She just knows that in a desperate moment she flipped the dials and whipped through time to the workshop where she met Stephen. 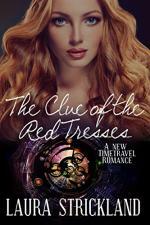 She can’t let Stephen, or her attraction to him, deter her from using the time machine again. Precious young lives are at stake, and to the mothers of Warsaw, Bridgetta represents the sole hope of saving their children. Fleeing the Nazis, with Stephen badly injured and the time machine damaged, Stephen, Bridgetta and their charges are flung back and forward through time. Is there a way to repair the time machine and win a future together, even though they were born so many years apart?